Oviedo, FL – July 4, 2016 – Goldson Gourmet LLC’s 4x award-winning Goldson’s MoreFire! 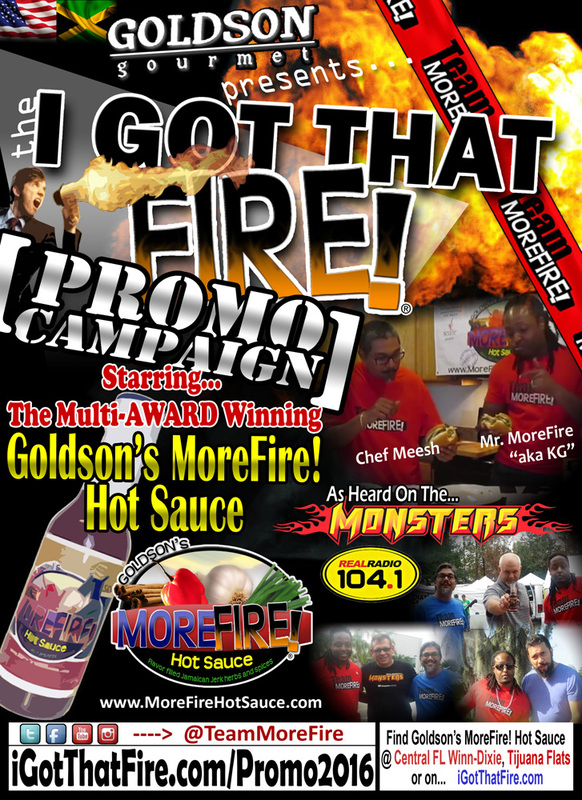 Hot Sauce is launching their I GOT THAT FIRE! 2016 Summer Campaign. After early 2016’s successful expansion of distribution for Goldson’s MoreFire! Hot Sauce, the time feels right to launch an official campaign highlighting this spectacular brand. In addition to the planned media outlets, such as social media marketing, email marketing, and in-person taste test tour events, Goldson Gourmet LLC has signed on with iHeartMedia, Inc., one of the nation’s leading mass media companies. Goldson Gourmet will be a sponsor of the #1 rated radio station among adults in the Orlando market, Real Radio 104.1 (WTKS-FM). It looks like there is no slowing down the momentum. Goldson Gourmet LLC further solidifies their commitment to current and future distributors to provide a profitable and viable product to offer to their consumers through captivating promotions such as this I GOT THAT FIRE! Campaign.